Army Reorganization Act of 1866 45p. Brooke, Gen. John R. 28pp. Charlo, Chief 2p., 10, 12, 15, 18, 40, 49p. Daggett, Lt. Col. A.S 65p. De Luca, Capt. Allessandro 94p. Fort Harrison 56, 59, 66, 69, 72, 74, 77, 108, 111p. Fort Keogh 5p., 23p., 46, 48p. Fort Leavenworth, Ks 24, 27, 35, 108p. NCO Quarters (T-201) 31, 68, 110, 115p. Recreation center (Building 4) 90p. Fort Sill, Ok 99, 102p. Foster, Col. M.Y. “Bo” 111p., 114, 129p. Historical Museum at Fort Missoula 8, 37, 71, 73, 76, 78, 82, 90p., 97, 107, 109p., 114pp., 124, 130p. Italian detainees 93pp., 103, 105pp. Laundresses 7, 11, 26, 28, 30p., 36pp. Mazurek, Attorney General Joe 121, 123pp. Missoula Art Museum 116, 131p. Missoula City Council 117, 122pp. Missoula County 2, 42, 46, 48, 67, 71, 73p., 87, 105, 111pp., 116p., 121, 126, 128, 130pp. Montana Attorney General 99, 119pp., 123pp. Montana Board of Regents 119p., 122, 124pp. New Northwest newspaper (Deer Lodge) 7, 17p. New York Times 55, 62p. New York World’s Fair 94p. Nine Mile 14, 85, 86p. Roosevelt, Pres. Theodore 68, 71p. Smith, Pvt. John B. 22p. St. Louis, Mo. 54, 57pp., 61pp. Steward, Chaplain T.G. 25, 45p., 65p. Students Army Training Corps (SATC) 74pp. University of Montana Foundation 57, 119pp. US Department of Dakota 28p., 34, 40, 43, 55, 69p. US Department of Defense 111p. US Forest Service 44, 73, 75, 85pp., 89, 91, 106, 108, 111pp., 118, 129pp. US General Services Administration (GSA) 110,112, 114pp. Federal Bureau of Investigation (FBI) 89, 94, 98, 101p. US War Assets Administration 111p. Wallace, Lt. Thomas S. 26, 38pp. Western Montana Ghost Town Preservation Society 110, 115pp. 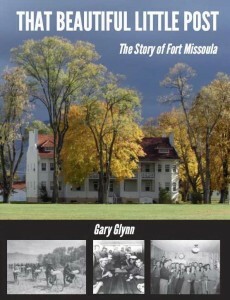 My Grandfather was James j Mc Grath and was stationed at Fort Missoula (US ARMY-Calvary not mounted). He was an boxer in the Army in Montana and Hawaii circa 1906-1912. and he also mentioned assinniboine as well.